There can be no doubt that modern day market is complex and dynamic. But whatever market wants to do, the most important and prominent method to understand the market's psychology is following the price action of the stocks or indices. As retail traders or investors often we have a scarcity of time and resources to analyse the complete aspect of the huge market. However, there are some simple price action based methods which can simplify the market understanding for us. This webinar tries to explore those simple techniques for the participants. Simplicity is preferable while dealing in the day to day movements of the market, until someone is a very short-term trader, having rule-based simplistic approach helps us to grow our account and create wealth over the long run. This webinar teaches you to approach the market with price action oriented rule-based simplistic methods so that you can become successful in your trading and investing endeavour. Vivek Bajaj has over 15 years experience in the financial market. He started his career as a trader, went on to become co-founder of Kredent, one of the largest proprietary trading desks in India and also co-founder of Irage, one of the largest algo trading desks in India. He is an avid learner and believes in the theory of sharing for caring. He had been a mentor of Kredent Academy since 2008 and has also co-founded elearnmarkets.com, India's only dedicated BFSI learning portal along with StockEdge App, India's Top rated Stock Analysis app. Step 1 : Click on 'Register & reserve your spot today!' button and book your seat for the webinar. Step 2 : You will receive an email containing a link to join the webinar. Step 3 : Click on the same link to join 15 minutes before the start of the webinar. Step 4 : Check system requirements and do necessary configuration of your headphone/speaker and system volume. to enhance exposure in financial marketing. The session was good. I am yet to learn a lot to actually make sense of such presentations. Thank you. 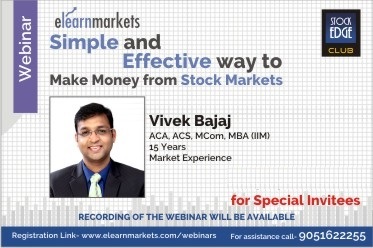 Glad to have attended the webinar class of Mr.vivek Bajaj looking forward to getting more webinar classes like this to enhance exposure in financial marketing.